Peter Wicks reports on the old media's disgraceful coverage of Craig Thomson's emphatic court victory yesterday and reviews the weak prosecution case against him. WATCHING THE TELEVISION coverage of Craig Thomson's day in court yesterday, you could be forgiven for thinking it was just a question of how long he was going to spend in jail. In the footage I saw on Channel Nine, they forgot a couple of words in their reporting. Little words like "allegedly" and using the words "accused of" instead of "did" for example. These words make a huge difference. The mainstream media have come to the conclusion that Craig Thomson has changed tack with his defence in seeking a summary judgement from a magistrate. This is completely false ‒ and totally irresponsible ‒ reporting. As I reported on 30 June, Thomson explained to me he was seeking a summary judgement when I asked him about his court appearance due the next day. That next day the MSM caught up and were reporting the seeking of a summary judgement as a way of escaping a judge and jury. Now they have forgotten all of that. Also forgotten is all the reporting of how broke Thomson is, forgotten is the fuss over the account set up for Thomson's legal defence, and forgotten is Thomson's legal fundraiser this Thursday. Also forgotten is the media's desire to see things happen quickly; they have suddenly forgotten that they were constantly bemoaning how long it was taking to have the matter finalised. Now they seem to expect that Thomson will be able to find vast sums of money under a rock and wait around for what would likely be over a year to stand trial before a jury. The media have taken the angle that the comment of Thomson's barrister Greg James QC that it was "very likely" that there would be few issues about the facts or charges Thomson is accused of means that Thomson is somehow admitting he did use the money for brothels and adult movies. This is yet another disgraceful example of just making up the news to suit an agenda. Last night, I saw they were replaying parts of the interview Thomson did with Laurie Oakes what seems like an eternity ago. In particular, the coverage focused on the part of the interview involving allegations of phone calls made from Thomson's hotel room. Thomson emphatically denied these claims while Oakes suggested that the only other option is someone sneaking in and out of his room and making calls while Thomson wasn't looking. To me, this seemed like an attempt to make Thomson look like he is either foolish or a liar. Thomson has never suggested that he has some kind of evil conspirator lurking in dark shadows, sneaking into his hotel rooms and following him around and doing things under his name. If, in fact, Thomson did not make the calls he denies making, I'd suggest it would be more likely that someone had amended records electronically or had the hotel staff amend them. I'm reasonably sure this would not be the first time records had been adjusted, or someone had an incorrect charge on a hotel bill. Thomson has been adamant in his denial of the allegations regarding these expenses on his card and continues to be adamant on the matter, despite the words the media try to put in his mouth. I contacted Thomson regarding the decision to award him a summary judgement. Thomson was quite clear in emphasising that he is not conceding to any of the allegations made against him in regards to expenditure — not in any way at all. What Greg James, QC, simply means is that the details of any expenditure will not need to be debated as it is irrelevant to the defence they are mounting. Remember, there are 173 charges, the vast majority of which are for amounts less than $30. It would seem ludicrous to spend tens of thousands of dollars of money that he doesn't have and putting his family into enormous debt to argue these matters when there is a means of resolving the whole matter quickly and cheaply. For those who don't know just how expensive the legal system is for someone in Thomson's position, the charges he is facing are for approximately $27,000; his appearance in court yesterday would have cost more than that, when preparation time and other ancillary costs are taken into account. There are those who suggest these allegations should be aired and argued, as people want to know if Thomson did in fact spend money at brothels. I can understand that point of view, however the media and the Coalition have made sure that Thomson will always be remembered for brothel visits and credit cards. Whatever a court decides will not change the fact that the name Craig Thomson will always be a punchline. Those who think that he is "escaping a jury" and that he would not be able to achieve "reasonable doubt" from just one of twelve jury members are forgetting the other facts that the media choose to ignore. 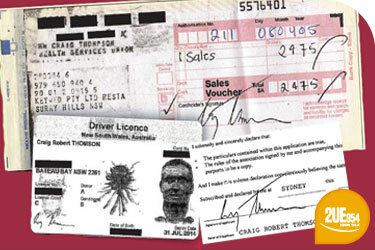 Craig Thomson surname on the credit card slip was spelt 'THOMPSON'. The misspelt name on the credit card. The credit card slip with a signature on the carbon copy, a rejection code, and the bank copy never sent to the bank. The only prostitute to come forward changed her mind the next day. The fact that he was in Perth and has supporting evidence to verify it when he was alleged to have been at a Sydney brothel. Despite subpeonas to countless brothels, including where Thomson is alleged to have gone, not one piece of video or any other type of evidence has been found. His accuser, Kathy Jackson, who has been a guest speaker at Liberal Party functions, is currently under police investigation for embezzling union funds. The threat made to Thomson by Jackson's factional pal Marco Bolano that they were gonna "set him up with hookers". The dodgy arrest warrant from Victoria Police. The independent report by KPMG that utterly destroyed the credibility of the Fair Work Australia investigation which formed the basis of Craig Thomson's witch-hunt and trial by media. All of that sounds like causes for reasonable doubt to me. Unfortunately for both Thomson and the public, the legal strategy from the puppet prosecution and their Coalition masters seems to have been to bankrupt Thomson and not allow evidence from both sides to go before a jury. The prosecution backed Thomson into a legal corner financially and are now surprised he has found a way out. As for the main stream media, it was reported by Independent Australia yesterday that the disgracefully inaccurate article by Pia Ackerman was edited so that entire paragraphs were removed after Thomson and his lawyers complained to them over their malicious reporting. However, no apology has been issued to Thomson from the paper that is so popular it has never made a profit in it 50 odd years of operation. Yesterday's court appearance was a victory for Thomson and a blow for those who are seeking to destroy him. Let's see if this new trend continues. Catch up on IA's full Jacksonville investigation here.